Whereas I don't really care much for rose-scented soaps and bath oils, I am all about rose water in the kitchen. I love it when it's paired with cardamom, and there's a cake I've made often that does just that; I like it in cocktails (martini, anyone? ), and, a very recent innovation this, I like it in spiced warm milk, à la Sanjana. I wasn't convinced it would go with coconut (and my lamington loyalties do, as you may have noticed, lie with the coconut) - my mum always has a big bag of mixed sweets in the car, and when I was really small I used to raid it for the Everton mints and coconut ice. I obviously have a thing for striped confections! But I remember one time when the pink layer of coconut was rose flavoured, and thinking it was vile in the extreme. It seems though, that my tastes have changed. 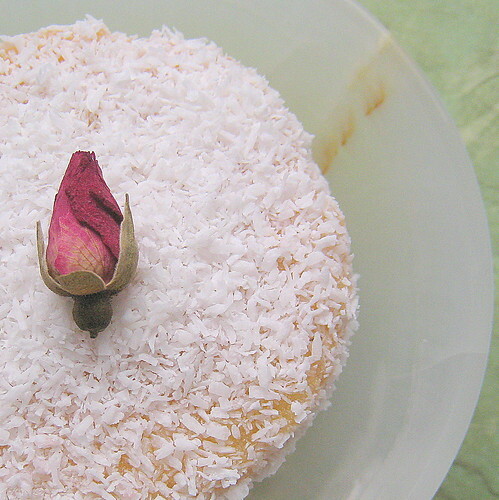 The rose lamington is a beautiful to taste as it is to behold! The fragrance hits you first; it isn't over-powering, but you do feel, on opening the tin, that you are stepping out into an English rose garden on a warm, sunny day. And, because these lamingtons are glazed (like the St. Clements version), they stay incredibly moist, with the sugary coconut shell just melting in the mouth. I actually can't believe how pretty these are. Do I sound immodest? Sorry. I've topped them with some dried rose buds, which are actually a herbal tea I bought yonks ago in an Chinese supermarket in Manchester. Since traditional lamingtons don't have topping, they aren't really necessary, but since I've never used them for anything other than to decorate Lucy and Rich's wedding cupcakes, I thought I get some further mileage out of my investment! All in all, a winner. No 'bloody, poofy, woolly biscuit' this. Cut the cake into whatever shapes you like. I used an upturned glass and a sharp knife to make circular lamingtons. Heresy! I got about 12, and ate the left over cake plain. Make a thinnish icing to glaze the cakes - mix the rose water and icing sugar, and add extra hot water as needed. Colour with pink food colouring if wished. Pour the coconut into a shallow dish, and dip the cakes first into the glaze, and then the coconut. Dry on a wire rack. Top with dried rose buds, and serve. Don't forget to Re-Invent the Lamington! Deadline 26 January. Hmmmmmmmmmm, i have a loads of dried rosebuds too....would be lovely to have some rose jelly in between - Hmmmm. Looking forward to putting mine up! I recently saved a photo of a cake with dried rosebuds on it, because it was so lovely... and here it is again! I love things flavored with rose or orange blossom water! These are gorgeous! The princess of lamingtons. Six different lamingtons? Insanity! SIX! Where do you get the stamina? How do you clean up all the coconut?! another great cake.. love the rose! A really stunning photo too! Ms. Humble - Stamina is my middle name. No, I lie. All this baking took the best part of four days; I enjoyed the first two. I have learned that challenges are fun, if you allow yourself time to complete them and the right to quit at any time. I allowed myself neither. Mistake! I still ♥ lamingtons though! I really have to have a go at doing lamingtons. I'd never even heard of them before I read your blog. Re-Inventing the Lamington - Voting Now Open! Re-Inventing the Lamington - The Round-Up!